Will the next AAA games be on your iPhone and Android device? Epic Games CEO Tim Sweeney thinks that mobile games are becoming competitive with console games, and companies throughout the industry are not taking advantage of the potential of handsets. Speaking to Business Insider, Sweeney maligned the distinction between ‘console’ games and ‘mobile’ games, suggesting that publishers of mobile titles viewed them as “a different game that [is a] dumbed down mobile experience”. He described the games market as being divided, with action games like Fortnite on consoles and mobile gaming dominated by slower puzzle games. Indeed, among the highest-grossing mobile games are puzzle games like Candy Crush Saga and Angry Birds 2, but Sweeney is convinced “the genre thing is overrated, and the platform decisions are overrated”. Is Fortnite blazing the trail? At GDC 2019 Epic released the Epic Online Service, a kit which lets developers add cross-play functionality to their games (as well as other features). This kit was inspired by the company’s success with Fortnite Mobile, which allows crossplay between Android and iOS devices as well as consoles. “Fortnite has paved the path for a lot of things. I think the cross-platform experience, companies throughout the industry are not taking advantage of that yet.” said Sweeney . PlayerUnknown's Battlegrounds, a close competitor of Fortnite, currently allows play between Android and iOS devices, but not between mobile and console. 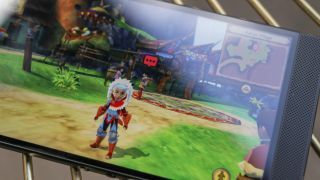 While Sweeney is taking aim at the games industry for not jumping on the trend of mobile gaming fast enough, there’s another problem he doesn’t address – namely that mobile hardware is still not in a prime place for competitive gaming. The fastest mobile chipsets, like the Snapdragon 855, still don’t hold a candle to the internal tech within a console or high-end PC. Furthermore, playing a game using a mouse and keyboard or console controller is very different compared to using a phone or tablet, where your fingers can easily get in the way and battery life prohibits extended gaming periods. Despite companies releasing phones that are designed to be great for gaming, like the Razer Phone 2 or the Asus ROG, handset manufacturers still have a way to go before they develop hardware that competes with other gaming devices. So, Sweeney might have to wait a little longer before mobile gaming becomes as competitive with console gaming as he’d like. What exclusives are on the Epic Games Store?